Restricted: The default execution policy, which forces commands to be entered interactively. All Signed: Only signed scripts can be run by a trusted publisher. Remote Signed: Any scripts created locally can run. Unrestricted: Any script can run. On a Mac, I frequently use the tail command to view files as they’re being written to or in use. You can use the Get-EventLog cmdlet to view logs. The Get-EventLog cmdlet has two options I’ll point out in this article. The first is -list and -newest. The first is used to view a list of event logs, along with retention cycles for logs, log sizes, etc. Get-EventLog -list You can then take any of the log types and view information about them. To see System information: Get-EventLog System There will be too much information in many of these cases, so use the -newest option to see just the latest: Get-EventLog system -newest 5 The list will have an Index number and an EventID. 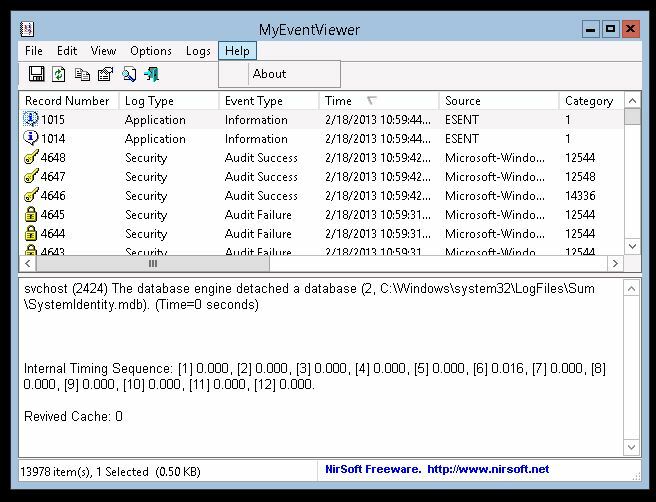 The EventID can then be used to research information about each error code. For example, at http://eventid.net. If you use Symantec’s Enterprise Vault solution and you need to migrate the SQL tables for Enterprise Vault to another server, you might have noticed that it’s not as simple as dumping tables from one host, restoring tables to another and changing some information on the Enterprise Vault server. This process takes a lot of time and is a relatively painful endeavor. But now Symantec has made the process much simpler, releasing a migration tool just for the database, available here: http://www.symantec.com/business/support//index?page=content&id=TECH214373 I guess they were listening to customers who complained about the process. Good for them! By default, when you require an SSL certificate in IIS on an Exchange server, if users hit the page without providing an https:// in front they will get an error. Rather than require certificates, it’s better in most cases to redirect unsecured traffic to a secured login page. In order to do so, first configure the redirect. 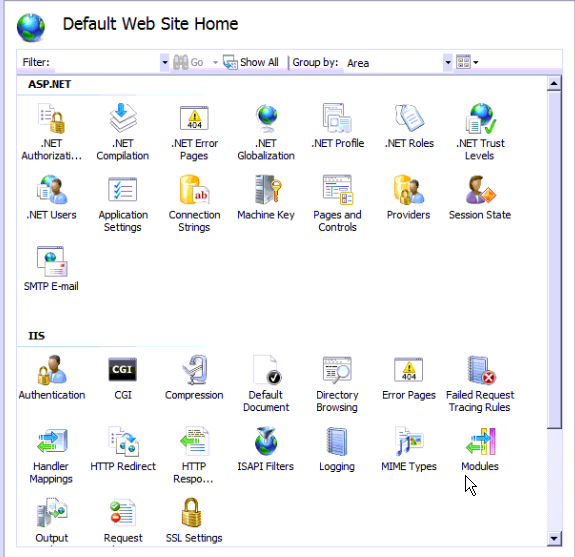 To do so, open IIS Manager and click on the Default Web Site. At the bottom of the pane for the Default Web Site, click Features View if not already selected. Then open HTTP Redirect. 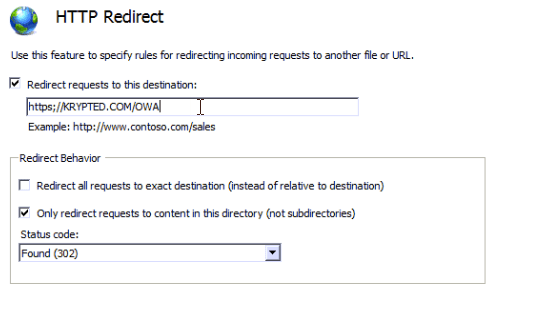 Here, check the box for “Redirect requests to this destination” and provide the path to the owa virtual directory (e.g. https://krypted.com/owa). In the Redirect Behavior section, select the “Only redirect requests to content in this directory (not subdirectories)” check box and set the Status code to “Found (302)”. In the Actions pane to the right of the screen, click Apply. Then click on Default Web Site again and open the SSL Settings pane. Here, uncheck the box for Require SSL. Once done, restart IIS by right-clicking on the service and choosing Restart or by running iisreset: iisreset /noforce Next, edit the offline address book web.config file on the CAS, stored by default at (assuming Exchange is installed on the C drive) C:\Program Files\Microsoft\Exchange Server\\ClientAccess\oab. To edit, right-click web.config and click Properties. Then click Security and then Edit. Under Group, click on Authenticated Users. Then click Read & execute for Authenticated Users in Permissions. Then click OK to save your changes. 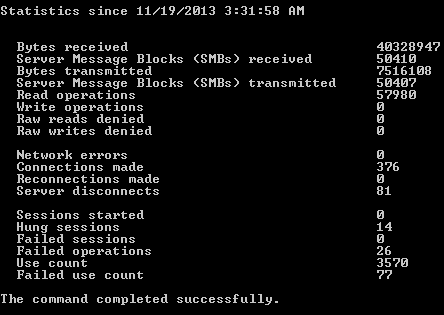 Finally, if you have any issues with any messages not working, start the IIS Manager. Then browse to the virtual directories and open HTTP Redirect. Then uncheck “Redirect requests to this destination” and click Apply. When you’re done, restart IIS again and test the ability to send and receive emails to make sure that mail flow functions without error from within the web interface.